Every once in awhile, instead of being irritated, I give a high five when things don’t go the way I planned. In this case, my lack of planning led to a new recipe that I would never have tried, and it was cause for celebration. 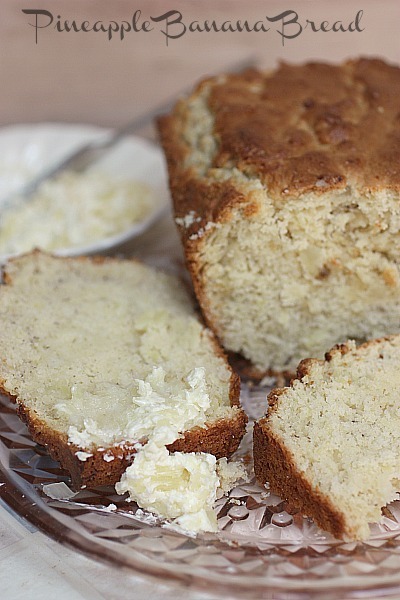 Having already mixed the dry ingredients, melted the butter, and basically prepped my family with a delicious “hot out of the oven” quick bread tease, I realized I didn’t have enough bananas or even zucchini to do either of my go to recipes, but I did have a can of crushed pineapple. With a few tweaks, it’s become such a great twist on my stand by recipe. When ever I make it, I seem to mix and match between muffins and loaves. I always double the recipe because it’s the same amount of work and twice the goodness. I wish I could tell you if it stays nice and moist days later, but it never lasts that long. Slathered with my homemade pineapple butter and it’s pure quick bread goodness. Enjoy!! I’m off to slice another piece (or two.) And if you like these, try my Pineapple Carrot Cake Muffins that start with a cake mix. 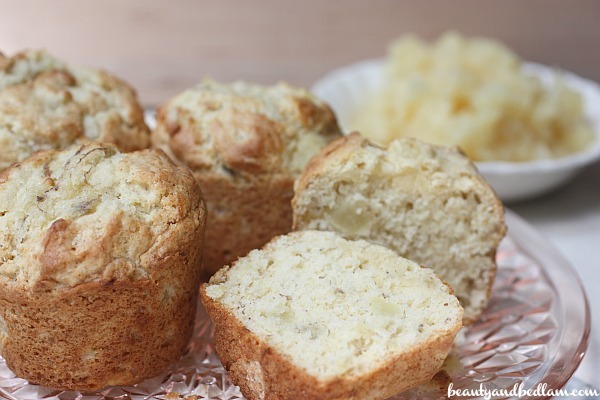 Summary: These delicious Pineapple Banana Muffins bring down home goodness right to your table. In another bowl, mix together the remaining dry ingredients (except for nuts) and combine with banana mixture. Mix thoroughly and add in melted butter. Mix. Pour into greased muffins pans and/or greased loaf pan. Bake muffins at 350 degrees for 20-25 minutes. Bake loaf at 350 for 45-60 minutes. Check both with tooth pick to see if done inside. Oven time varies. Yum. Cant wait to try these. YES! I’ll take some of those muffins for breakfast in the morning! These muffins were wonderful! So moist and flavorful. I even used white whole wheat flour and reduced the sugar to 1/2 cup. Delicious! I left the nuts out because my son doesn’t like them, but they would be a great addition. You said you used your homemade pineapple butter on them do you have that recipe? Hey! Saw this pinned the other day, and had to try it. One thing- I doubled your recipe amounts because I thought “6 servings will last like 3 seconds around here” and I ended up with a dozen regular size muffins and two full trays of mini muffins. Which, I mean, I’m totally cool with because this recipe makes some super delicious muffins. Thanks for sharing! Made these today and they are delicious! Substituted half the flour with wheat flour and the butter with coconut oil to make dairy free. These will definitely be a go to for breakfast and snacks. Thanks so much! So glad to know that the substitutions work well. I’ve been using coconut oil a lot more as well, but hadn’t tried them in these. What all did the coconut oil replace in the healthy version? 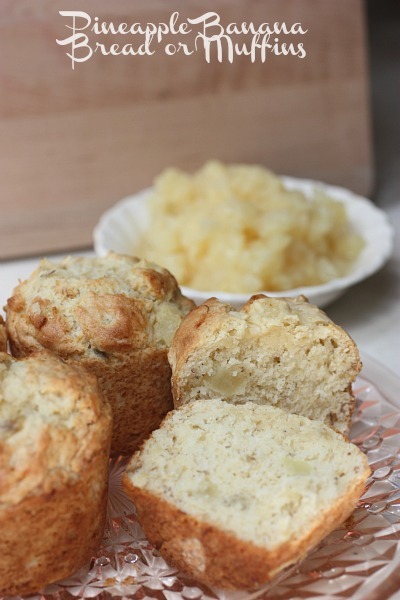 What a great variation on the basic banana muffin recipe. We all loved them! This is the best banana muffin recipe I have ever made! I only used 2 ripe bananas and a can of crushed pineapple. Also finely chopped walnuts. I usually add a little less sugar to all my recipes, but this didn’t call for all that much. This is a keeper from now on. Thank you! These are in the oven now. I added pecans. I got 15 muffins filled to the top. Thanks for a new banana muffin recipe! These muffins are delicious! I have made them 3 or 4 times and they are my new favorite. Very dense with a hint of cinnamon. Thank you for the recipe. Just made these tonight. Super delicious! I think I’ll use the whole can of crushed pineapple next time though. And I added shredded coconut to mine! I got 16 out of the batch too. Thanks for the great recipe!